Have a Blast with EFK's Birthday Parties! 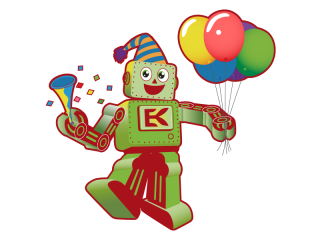 Create Your Perfect Engineering Themed Birthday Party With EFK Winnipeg! Step 2: Choose your date/time and select a party theme and 60 minute activity from the options below. LEGO® Robotics Gear Up- Party guests will build a robot and battle against their friends in SUMOBOTS. Junior LEGO® Robotics - Kids build wild animals using Lego, sensors and motors. Hungry Alligator, Roaring Lion, Drumming Monkey and more! Blimps - Kids will build and test their own airborne blimps, they explore the principles of buoyancy to create a neutrally buoyant blimp. Bottle Rockets -Children will learn how simple air pressure can jettison a rocket more than one hundred feet in the air. Baker’s Delight + Secret Ink- Party guests will use a secret ink to write a message for the birthday girl or boy that will be revealed at the end of the party. As we wait for the secret message to unfold, kids will make their own ice cream. Marble Run - Kids use their creativity to design and build a track to guide their marble to the finish line. Wind Turbine -Children will learn how to transform wind energy into electricity by building their own wind turbine. Blast Off Rocket - Design model rockets using a straw, clay, and paper fins and test the design of their rocket using a pneumatic launching device. Step 3: Choose your birthday party package from the options below. Contact us to reserve your date today! (204) 808-3019 or fill out our contact form.